The Hubble Space Telescope has broken the record for most distant 'ordinary' star ever observed, at an incredible 9 billion light-years from Earth. In comparison, the age of the universe is roughly 13.8 billion years. In most cases, it is impossible to observe the light from ordinary, main sequence stars, such as the one recently observed by Hubble. However, this observation was made possible by a rare alignment. Astronomers found the star, nicknamed Icarus, using gravitational lensing. This phenomenon occurs when a massive object, such as a galaxy cluster, bends the light from objects behind it, making dim objects appear much brighter from the perspective of Earth. This can be compared to the effect of an intergalactic magnifying glass. 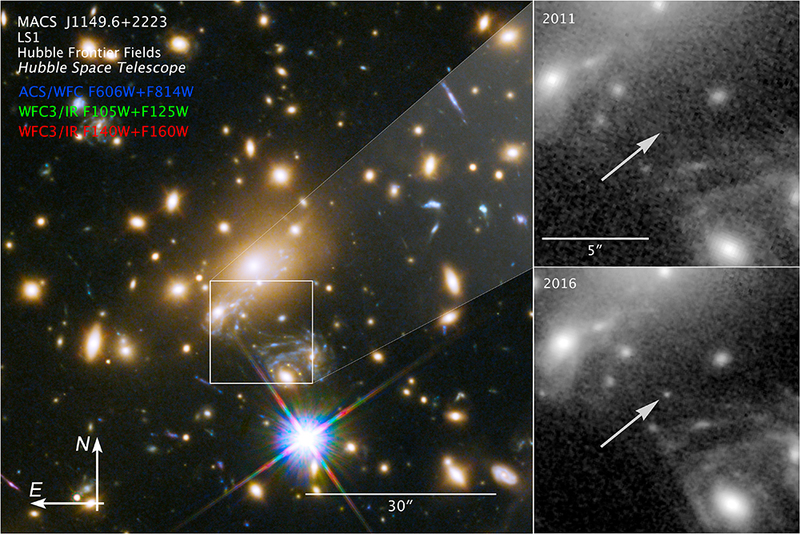 Yet unlike previous gravitational lensing events which normally magnify objects up to 50 times, this newfound star was magnified over 2,000 times since a star was briefly passing through the line of sight of Hubble and Icarus. "There are alignments like this all over the place as background stars or stars in lensing galaxies move around, offering the possibility of studying very distant stars dating from the early universe, just as we have been using gravitational lensing to study distant galaxies," said study co-author Alex Filippenko of UC Berkeley. "For this type of research, nature has provided us with a larger telescope than we can possibly build."